In mid-December, 2015, we were asked to provide a Christmas Trial for a global company, Kroll Ontrack, for them to invite their lawyer clients. The report below was written by one of the guests. 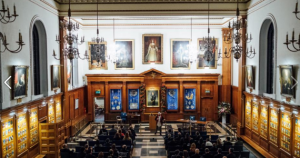 The Honourable Society of the Inner Temple is famed for its rich legal history, art collection and its enviable array of alumni, including two former PMs, Chaucer (maybe), Baroness Butler-Sloss (of Diana inquest fame), Sir Francis Drake (explorer) and even Gandhi, to name but a few. But this past week, the solemn surroundings of the Temple’s Main Hall were subject to a very different kind of ‘nonviolent civil disobedience’ in the form of the Kroll Ontrack Christmas Party with special comedy guests, This Is Your Trial. For the uninitiated, This Is Your Trial is an improvised comedy show where professional comedians play the judge, clerk, prosecution and defence. Members of the audience are then given the opportunity to accuse their friends of crimes. The clerk then selects three cases with the remainder of the audience acting as jury to determine the accused’s fate, hopefully with hilarious results. First in the dock was our own esteemed Legal Technologies Director, Mr. Andrew Szczech, charged with the particularly grievous crime of ‘rapping at karaoke’. An attempt to gain leniency by entering an early guilty plea was rejected by the court after it was pointed out that the evening was a lot more fun if we actually had a trial. Despite wafer-thin evidence and an extremely unreliable witness, who may or may not have been in the unknown location where the incident is alleged to have taken place, Mr. Szczech was rightly found guilty and sentenced to pay a fine of 50 cents. about his clients and, most seriously of all, c) putting his children to bed! All these acts, in the eyes of his accuser, were not the normal activities of a Partner at a City law firm. During the trial, it transpired that the dastardly Mr. McQuitty also played tennis to an above average standard and regularly chopped wood in his garden; all wholesome activities which the prosecution leapt on to prove his inherent abnormality. However, the defence cleverly pointed out that all of these details considered together likely rendered Mr. McQuitty a psychopath, just like everyone else in the room. The psychopathic jury agreed and let him walk free. The final defendant hauled before the Court was Kroll Ontrack Case Manager, Stephanie Painter, accused by Peter Susman QC of being ‘too nice’, his sworn evidence being cited as ‘just talk to her’. The Court quickly accepted that Stephanie was indeed ‘nice’, but the case revolved around the central issue of whether she was ‘too nice’. Steph didn’t help her case by admitting that if she stumbled upon an upturned tortoise she would ‘nicely’ turn it the correct way, rather than beat it to death with a rock – pretty nice of her! But ultimately her excellent defence counsel made a very compelling argument that there was indeed a limit to Ms. Painter’s niceness, and seemingly that limit could be found somewhere between allowing Jeremy Clarkson to enter the party but NOT Katie Hopkins or Hitler. This total disregard for the feelings of two of the most monstrous individuals ofrecent ages meant the jury vociferously and unanimously determined that Steph was indeed ‘nice’ but was not guilty of being ‘too nice’. I must say, the comedy was absolutely brilliant. So good that I have actually googled their upcoming London dates to take some friends to see a show! All in all, another fantastic event, a huge thanks to all clients and prospective clients for joining us and we look forward to socialising with you again in 2016.